I was just considering buying these 2 synths last night and, lo and behold, it was clearly meant to be! Still not cheap, but compared to the quality, it's a bargain. Be forewarned that these analog emulations can eat CPUs alive depending on you configure them and play them. But the sound.... oh, the sound.... If you use a PC as well as iOS for music, and there's any way you can scrape up the cash, these are among the best VSTs made to date. Basically, with Repro, I don't ever see myself buying a Prophet. Diva is a bit of a chameleon, able to sound like a lot of analog synths. All I have left to buy, separately, is Synapse Audio The Legend to get the best Moog D emulation, and then some wavetable synth like Hive2, Massive2 or Dune3, etc. Stupid question, but I’ve just started getting into Mac music production. Is there anything that these offer over the Arturia V Collection? I bought those already, and also have Pigments and Alchemy in Logic Pro X. If you have the disposable income, then YES. If it's not an automatic decision, then... probably not worth it. That said, I don't believe there's ever been a sale like this to date on the U-He products (they don't usually have sales), so unless this is a new direction for them, there may not be another sale like this any time soon. If you have the money but are still on the fence, then I'd probably say, don't buy more. Instead, learn what you have really well. I've used Arturia V. There's probably no beating it for the overall value and they all sound good. However, they aren't necessarily "the best" emulations. Does that even matter in a song vs. demo-ing sounds? Often times not! If you love the sound of real analog and want that or need that in your music, then there can be better options. 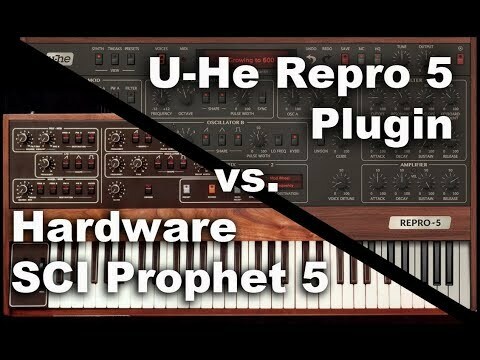 For instance, the Arturia Prophet emulation will sound more digital, weedy and thin vs. the U-He Repros. But also take less CPU. The Arturia Moog D emulation will likewise sound more digital, weedy and thin vs. Synapse Audio's The Legend (next on my list to get). The competition to Arturia in those cases sound almost indistinguishable from the real thing, at least compared app to app. I'm less familiar with Pigments, though I used the demo. Diva undoubtedly sounds more analog, but each have their strengths. Again, if you don't crave the "authentic analog" sound or need or want it in your music, then don't spend more money to get it! Finally, in terms of the U-He effects that come in the $280 bundle. They're also really good (also tend to consume CPU), but I already have others and so I opted to not spend the extra money, though I wanted to. Thanks for the response. I do need to focus on what I already have, and quit chasing the shiny things. I’ve heard great things about these synths.